Summer is upon us, and one of my favourite things of the season has got to be eating our family meals or entertaining friends, out under the pergola. I don’t know what it is about eating outside but it is so much more relaxed than sitting inside, at the dining room table. When we’re outdoors, we tend to linger longer. Chat more. Relax. Many friends and family have been entertained and much food has been consumed in this outdoor area. But even though entertaining outdoors is fantastic, it also has a downside. Bugs. Flies. Mosquitoes. Urgh! As the sun goes down, the mosquitoes come out to cause havoc with our exposed bits (ie legs, ankles, arms etc). We used to burn citronella candles, but they’re not very effective (unless you’re sitting with the burner right beside you). 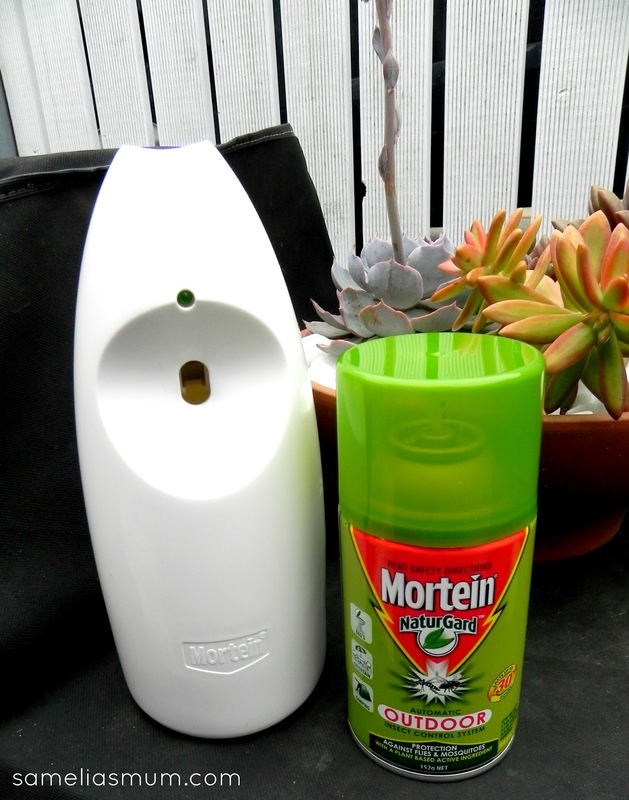 Mortein have a new and effective way to keep outdoor entertaining areas protected from flies and mosquitoes. Mortein NaturGard Outdoor is a system which releases regular bursts of mist containing plant based active ingredients and allows you to regulate the timing depending on your conditions. I was sent a Mortein NaturGard Outdoor Automatic Insect Control System to try out here at home, but as we were away this weekend, we decided to take it with us and to use at our cabin at the lake. As you know, bugs and mosquitoes love it near the water but we found that we could keep them at bay, enjoy our family time and eat dinner out on our terrace even after the sun went down. With thanks to Mortein and Nuffnang, I have five (5) Mortein NaturGard Outdoor Automatic Insect Control Systems to give away. Why would the Mortein NaturGard Automatic Insect Control System be a great product for your home this summer? Anorina, where do you put it? Does it sit under the table, or up high? A dream come true! The best time of year but sadly it brings all the creepy crawlies out!